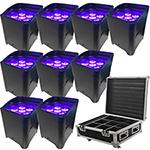 The large Chauvet SlimPar 38 Up-Lighting System is the perfect add-on for your next wedding or dance. We double the number of light fixtures from our smaller SlimPar 38 lighting system with this system to up-light a larger venue. 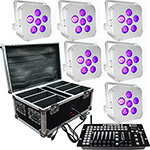 The SlimPar 38's are DMX controllable fixtures that work with the included Chauvet Obey 3 compact DMX controller. 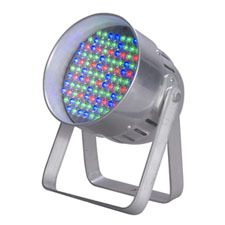 The lights have an adjustable stand so that you can place the fixture in almost any location. The 75 (25 red, 25 green, 25 blue) LEDs produce a wide range of colors which allow you to customize the appearance of your room. The Chauvet Obey 3 offers playback options including automated, sound-activated or manual RGB color mixing. The Obey 3 is a perfect controller for a lighting novice or someone who wants to easily control their LED washes.